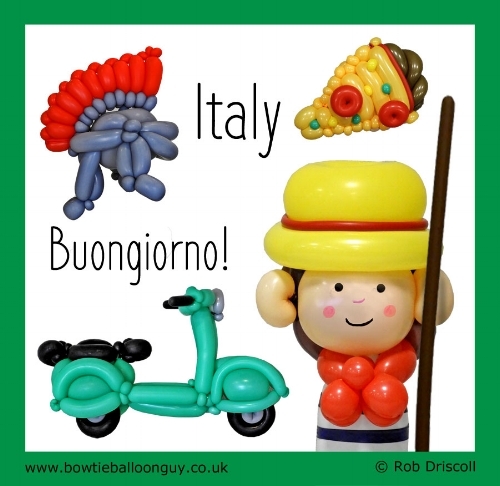 This week I am taking a look at a wonderful country, it is Italy, I made ALL these balloons at the Balloonapark event in Paris last week. The first of the items I made was the Roman Helmet, I love delving into the history of Italy and of course the Romans feature heavily in the history books. The traditional date for the creation of Rome was 21 April 753 BC (how very accurate). The correct name for my Roman Helmet is a Galea, my helmet mostly resembles an Imperial Gallic helmet. How could I take a look at Italy and not make a slice of Pizza?, The word Pizza dates back to 997 but similar pizza style dishes have been around for centuries before that. The world's largest pizza was created in Rome during December 2012, and measured 1,261 square metres, The world's longest pizza was made in Naples in 2016. It was baked using a series of special ovens on wheels which moved along its length, and measured 1.15 miles in length. My Scooter is a Vespa, The name Vespa means Wasp in Italian, This wonderful little scooter was first created in 1946 and shot to fame in 1952 when Audrey Hepburn rode side saddle with Gregory Peck through the streets of Rome in the movie Roman Holiday.